Getting fit isn't just about riding lots - but riding smartly. The Wahoo Kickr is another trainer that is perfect for MTBers wanting an edge. Indoor trainers. Are there any other two words loathed by mountain bikers? I'm not sure there is. I suppose that 'Wet Triathlete' and 'Chamois Cream' come pretty close, but it's a pretty well known fact that us knobbly tyre folks are the kind of people who would rather be caught with our pants down at a sports carnival than be seen riding a stationary trainer. After all, we're outdoorsy people - why spend our free time spinning pedals and not going anywhere when we could be exploring the hidden joys of nature? I'm not here to convince you otherwise, because as well as being outdoorsy people, we're also pretty stubborn too. That said, many mountain bikers are slowly beginning to cotton on to the benefits that a little bit of indoor cycling can do for your riding experience. These days you'll find that any XC racer or enduro slayer worth their salt makes use of an indoor cycling trainer. Heck, you'll even find pro downhillers warming up at the top of the mountain before starting off on their race run. Is indoor cycling for you then? Well, that's entirely up to you to decide, but there are some relatively simple facts on the table. Firstly, the fitter you are, the faster and longer you can ride your mountain bike. Secondly, the fitter you are, the less your mental concentration suffers on long rides. Poor concentration leads to you crashing more. Thirdly, mountain biking is not a great training tool compared to road riding or using an indoor trainer. Why? Mountain biking is very sporadic when it comes to pedal activity. You might have plenty of high intensity efforts, but you'll spend a lot of time coasting too. If you want to improve muscle memory and to get base miles under your belt, you need consistency, and a trainer gets you that. 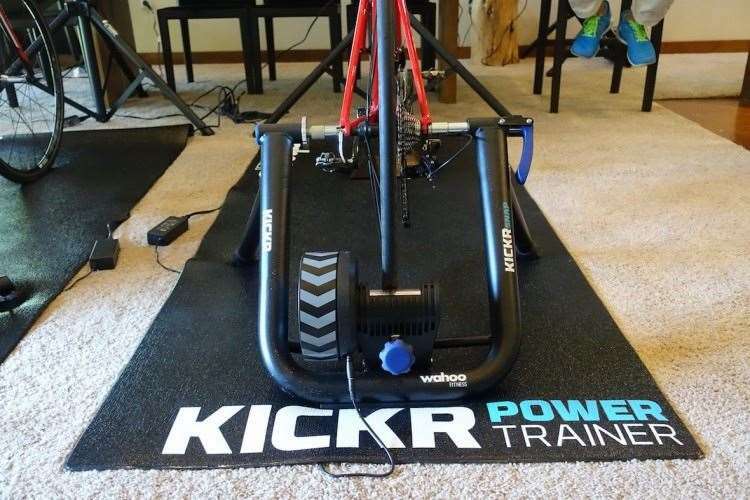 Wahoo Fitness is a company that is best known for their revolutionary cycling trainer called the KickR (above). It's a pretty serious piece of kit that's designed to give you incredibly accurate riding data so you can get more out of your training. It's also one of the few trainers on the market that features swappable end caps so that you can fit 130/135mm quick release dropouts, or 142x12mm thru-axles. 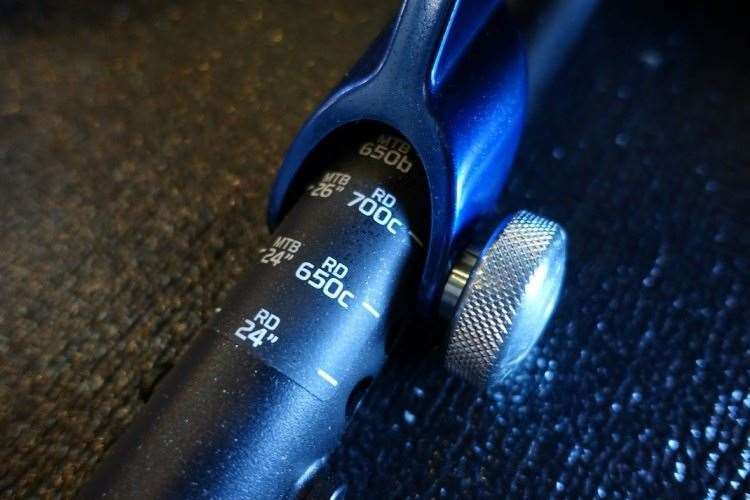 This means that you can hook up their fat-tyred rig without issue, and because the KickR is a 'wheel-off' trainer (meaning you remove your rear wheel before putting the bike onto the trainer), you won't be wearing out your sweet new tubeless tyre. 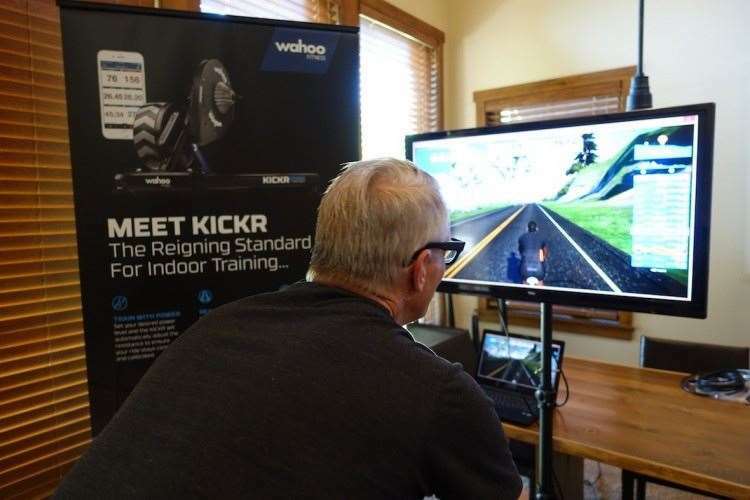 Last month at PressCamp in Park City, I met the guys from Wahoo Fitness to learn more about the KickR trainer, and why it's become one of the most potent training tools for mountain bikers. The crew also took me through their new mid-priced KickR Snap trainer, as well as their range of accessories like the TickR heart rate monitor and RPM cadence sensor. We discussed many things over coffee and the Tim-Tams I brought with me to share, such as the inherent differences between road cyclists and mountain bikers, and their multiple approaches to training. What we did agree on however (aside from Tim-Tams being way better than any American biscuit), was that a couple of short and sharp sessions on an indoor trainer each week can make a significant difference to your riding out on the trail. In those two 40-minute sessions, you can do your legs and lungs more benefit than if you were to spend several hours slogging through the winter mud destroying both your drivetrain and the trails. What Wahoo are increasingly finding though, is that their customers aren't just using their indoor trainers for winter training, and that it's becoming a year-round training tool. A lot of that has to do with the trainers wireless connectivity that allows you to sync it with various Apps for a more creative workout. This means that both trainers can be paired up to your iPad, laptop or TV, so that you can ride with other cyclists from all around the world using a multi-player program called Zwift. It's pretty freaking cool actually, and it's designed to make training a whole lot more fun than it's ever been before. Before going any further into that though, let's have a closer look at the history behind the revolutionary KickR trainer. The first product that Wahoo ever released was the ANT+ key. Originally designed to allow your iPhone to be used with heart rate monitors, the ANT+ key can also be used with your iPad so it can communicate with the KickR trainer, or any of your existing ANT+ cadence and speed sensors. Wahoo Fitness was by a founded 5 years ago by a bunch of fitness-oriented tech geeks. 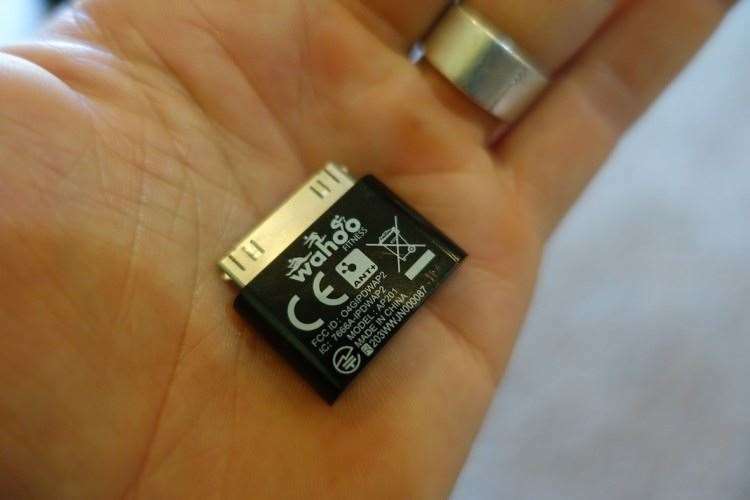 The company's first product was the little ANT+ key I'm holding in my hand in the above photo. This key was designed to unlock the power of the iPhone as a fitness training tool, by allowing it to talk to your heart rate monitors, so you could utilise a whole range of apps depending on what sort of data you wanted to collect. 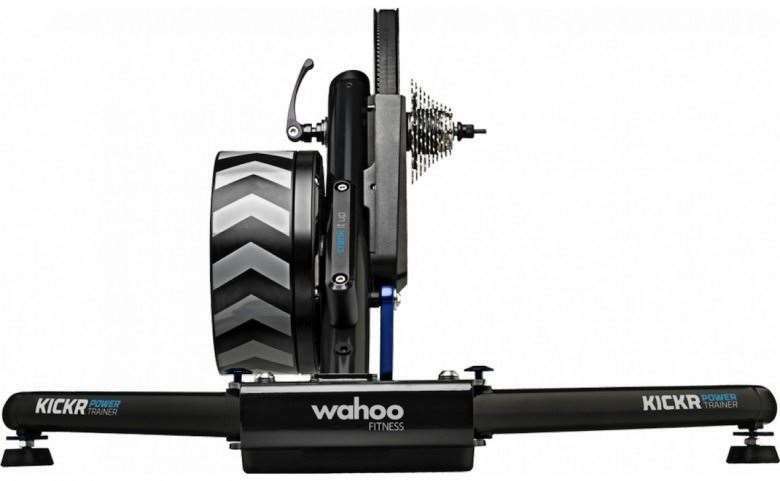 In 2012, Wahoo then introduced the KickR as the world's first electromagnetically controlled trainer with an in-built power meter. The following year Wahoo offered an open IPA for other companies to build apps that would talk with the KickR trainer, and now there are 15 different app companies building cycling-specific programs. In 2014, Team Sky signed a deal with Wahoo to supply their team with the KickR trainer for training as well as pre-race warmups and post-race cooldowns. The accuracy and repeatability of the KickR's resistance control was what Team Sky wanted for their athletes, who are famously known for their highly stringent training programs. 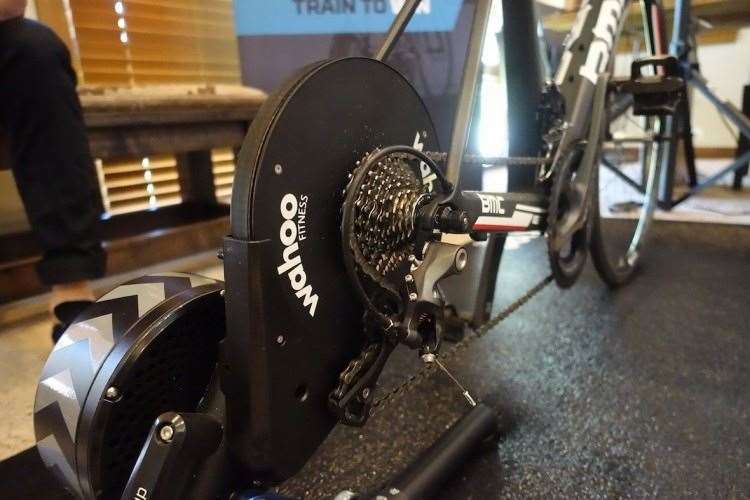 Since then, the KickR has become one of the most sought-after trainers on the market. It's particularly popular in Australia, which is currently the 3rd biggest market for Wahoo in the world. The KickR is designed around a heavy 5.6kg flywheel that better replicates the inertia felt when cranking along on the trail. The flywheel is surrounded by electromagnets that control how much resistance you feel at the pedals. By plugging the KickR into a power socket and then wirelessly pairing it with your iPhone, iPad or Laptop, you can then use a range of suggested Apps to control the trainers resistance. This keeps the trainer super simple in itself - there are no cables, remotes or levers for you to adjust resistance, as it's all done wirelessly and via computer control. Wheel diameter: 24", 650c, 700c, 27.5", 29"
An adjustable arm allows you to easily setup the KickR for different sized wheels, whether you're using a mountain bike or road bike. Once you've got your bike setup on the KickR trainer, you can sync it up to talk wirelessly with a device such as an iPad. Wahoo make their own cycling apps, or there's a whole range of other cycling apps that you can download to control the KickR's resistance. The most significant advantage of the KickR is its in-built power meter, which provides a highly accurate readout of your power output. This is regarded as the most effective form of training, because unlike heart rate-based training, power never lies. You can do a whole session trying to aim for a particular power average, or you can do interval training where you're trying to hit certain peak power outputs. But if you're like me and you're not particularly good at motivating yourself, you can make use of the many simulated workouts in the Wahoo Fitness app that instruct you the entire way from start to finish. Already got a trainer but still want to make use of a sweet training app on your phone or iPad? 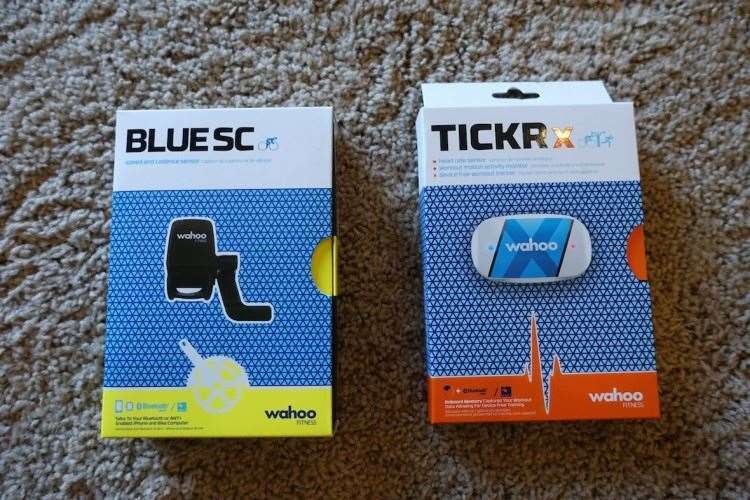 Wahoo have got you covered there with the Blue SC speed/cadence sensor and the TickR heart rate strap. Both will talk to your existing ANT+/Bluetooth cycling computer, and both can help you get connected with Zwift too. The other news from the Wahoo Fitness camp is the release of their new Snap trainer. Designed to offer the same electromagnetic resistance as the KickR, the Snap does so in a more affordable package. It still uses a big-arse flywheel, it still communicates wirelessly with your phone/iPad/PC, and you still plug it into the wall to provide electronic control of the resistance. However, it features a more conventional roller design that means you leave your rear wheel on the bike and simply clamp the rear dropouts into the trainer. The only bummer about the Snap trainer is that it's really only compatible with quick release dropouts due to the clamp design, so your new-school mountain bike won't likely fit. However, if you've got a road training bike or an older 26" hardtail that you're looking for a new use for, the Snap is a great way to access the same training tools as the KickR, but for a few hundred bucks less. It also weighs about 5kg less too, making it a little more portable if you're looking for a pre-race warmup trainer. Wahoo Fitness products are distributed in Australia by FE Sports. To find your nearest authorised retailer, head to the First Endurance website for a list of stockists. 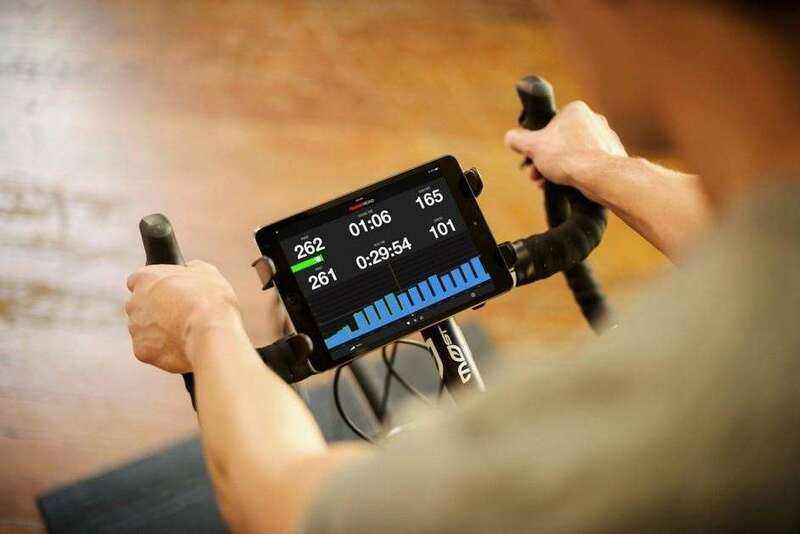 If you're a little more intrigued about indoor cycling after reading this post, checkout the Wahoo Fitness website for the full rundown on what makes the KickR and the rest of their product range so sought after.